From free music to seeing the players selected, this is everything you need to know about the 2019 NFL Draft in Nashville. 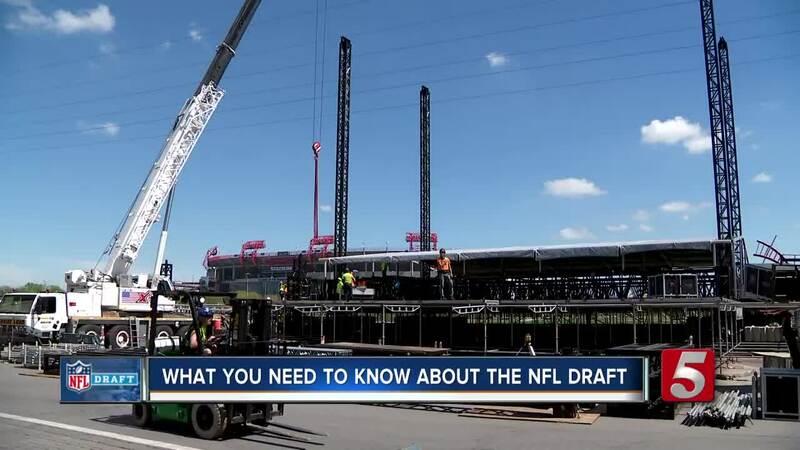 NASHVILLE, Tenn. (WTVF) — There has been a lot of talk about what is happening where in Nashville for the 2019 NFL Draft. Hopefully, this article will help clear some information up, and equip you with what you need to know about the NFL Draft. Where are all of the events happening? Broadway and 1st Avenue for the NFL Draft Main Stage. River/south side of Nissan Stadium for the NFL Draft Experience. The Schermerhorn Symphony Center square for Selection Square. There will also be NFL Draft shops, concessions, and other NFL Draft related areas throughout the downtown area. Do I need tickets for the NFL Draft? Kind of. You don't need to pay for any tickets, which is great news, and is always the case at NFL Drafts. While the NFL Draft Experience and Selection Square areas are open to the public and require no tickets whatsoever, the NFL Draft Main Stage requires you to join a "virtual line" through the NFL Fan Mobile Pass app (free to download on Apple and Android) for a chance to receive access in the "Drafted Fan Zone." That is right in front of the stage at 1st and Broadway, where selections for the draft will be announced, and performers Tim McGraw and Dierks Bentley will take the stage to perform at the end of draft days. When space becomes available and you're selected to join the Drafted Fan Zone, you'll be sent a text message and will have 30 minutes to check in. The text will have instructions on where to go and how to check in. You can join the virtual line for the Drafted Fan Zone beginning at noon on Thursday the 25th, noon on Friday the 26th, and 8 a.m. on Saturday the 27th. What can I experience at the different locations? Not all of the details have been released, but here's what we know for each location. At the NFL Draft Main Stage, draft selections will be announced by the NFL Commissioner and special guests, including NFL legends and celebrities, and players that are present will be brought up on stage and presented to fans, and to the viewing audience across the world. Round 1 starts on Thursday at 7 p.m., rounds 2 and 3 start at 6 p.m. on Friday, and rounds 4-7 start at 11 a.m. on Saturday. Tim McGraw will perform following rounds 2 and 3 on Friday night, and Dierks Bentley will perform following rounds 4-7 on Saturday night. At the NFL Draft Experience, you can experience live music from Nashville artists spanning multiple genres, get autographs at an autograph stage, check out the Vince Lombardi Trophy, participate in NFL challenges including the vertical jump, 40-yard dash, as well as throwing and kicking challenges. There will be opportunities to dress up, to see Super Bowl rings, as well as get some free swag from numerous sponsors. Also, because the reason for all of this is the draft, there will be large screens set up so you can see the pick announcements from the Main Stage on Broadway. At Selection Square, NFL team coaches, GMs, and their teams will be hard at work making their draft picks. This will be done inside of the Schermerhorn, and the 'war rooms' as they're referred to will be off-limits to the public. Out in the square, though, there will be an NFL shop, as well as at least one large screen for fans to view the picks on. I hear there's a lot of music involved in the NFL Draft. I mean, we are Music City, right? Where can I catch all of this music and who's playing? This NFL Draft will have more music than any other draft in history. For the first time ever, the NFL will have a house band during first and second round to play in between selection announcements. The members of the house band have not been announced publicly, but we expect to get that information about a week before the draft. Beyond the house band, GRAMMY-winning gospel music great CeCe Winans will sing the National Anthem to open NFL Draft activities on Thursday, April 25 at the NFL Draft Main Stage. Tim McGraw will perform at the NFL Draft Main Stage following the second and third round on Friday, April 26th. Dierks Bentley will perform at the NFL Draft Main Stage following the fourth through seventh round on Saturday, April 27th to close out the draft. The majority of music, spanning numerous genres, will take place at the NFL Draft Experience at a special music stage on the city side of Nissan Stadium. Performers include: New North, DJ Mel, Striking Matches, and Mikky Ekko on Thursday. Jessy Wilson, Willie Jones, DJ Mel, Kid Politics, Jonny P, Charlie Worsham, and Rayland Baxter on Friday. Katie Schecter, Jason Eskridge, Three Star Revival, DJ - Case Bloom, Andrew Combs, and Charles Esten on Saturday. Times when the artists will be taking the stage are available on the NFL Fan Mobile Pass app. Will the NFL Draft selections be displayed at different areas throughout the Draft footprint? Yes, there will be large screens throughout the footprint of the NFL Draft, both in the downtown area and over at Nissan Stadium, broadcasting the selections in the NFL Draft. Are any of the NFL prospects coming to town for the draft? Yes! Plenty of prospects will be in attendance, ready to go up on stage to celebrate joining their new team. At least 23 players have been confirmed, including Kyler Murray, Nick Bosa, Josh Allen, and Quinnen Williams. Click here to see a full list of those confirmed to attend. Should I try and find a spot on a rooftop downtown to watch the festivities? You can try, but it'll be a challenge. Most of the venues downtown have been rented out by the NFL or other groups for private parties. The list of rented out venues includes Acme Feed & Seed, Hard Rock Cafe, Nashville Underground, Rock Bottom, Tootsie's, Kid Rock's Big Honky Tonk, and Ole Red. It's also possible that others have been rented out, so you'd be gambling to rely on a rooftop for a view of the NFL Draft Main Stage. Should I just stay away from downtown? No doubt, sitting on the couch and watching on TV in your own home would likely be the most comfortable way to watch this year's NFL Draft, but if you're a fan of football and have always wanted to experience the NFL Draft, or even if you're not a fan of football but want to experience one of the largest sports-related events in the world, this is a can't-miss event. If I plan to go to the events, should I use rideshare? Or should I drive myself? If you drive yourself, there will be free parking at Nissan Stadium (lots A B C D) and a few other lots that have yet to be announced. Nashville also has plenty of options for parking if you're willing to pay, but finding free parking outside of the lots designated by the city could be a challenge. If you choose to use rideshare or have a friend drop you off or pick you up, there are designated rideshare drop-off/pick-up areas near Nissan Stadium and in the downtown area. The designated areas by Nissan Stadium are located in a parking lot just off of Korean Veterans Blvd on the Nissan Stadium side of the road. For downtown rideshare drop-off/pick-up, there are areas designated on Korean Veterans Boulevard to the south of the Draft footprint, and there are areas on 2nd, 3rd, and 4th Avenue north of Commerce Street designated on the north side of the Draft footprint. In other drafts, I've seen fans selected by each team that get a special experience. Is there anything like that this year? Yes, the NFL will have special seating for super fans of each of the 32 teams. Where can I learn more about the NFL Draft? NewsChannel 5 will be doing constant reporting on the NFL Draft over the coming weeks and throughout the NFL Draft itself. You can always find more information on our website, NewsChannel5.com, or you can download the NFL Fan Mobile Pass app and create your own schedule, see a map of the NFL Draft layout, and join virtual line to get into the Drafted Fan Zone. You can also find more information about the 2019 NFL Draft in Nashville by visiting the Nashville Convention and Visitors Corp. website .